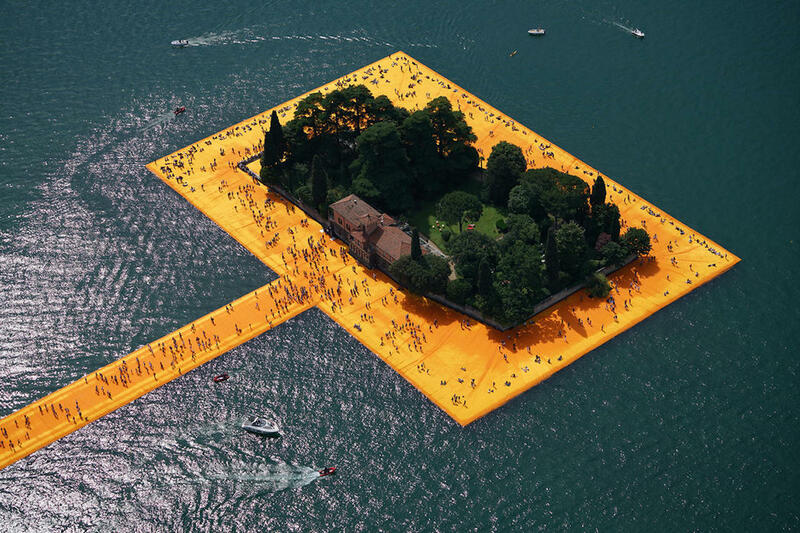 The work of Christo brought on the Iseo Lake 1.5 million of visitors whose awareness of the work has to be demonstrated. Put it this way, the dress code consisted of tank top and slippers. No many alternatives. Said so doesn’t sound nice. Yet the first contact you have with Floating Piers is an inelegant and vaguely interested heap of people. The classic approach to showing oneself at every event. Get to Sulzano, a small town on the banks of Iseo Lake, it’s odyssey paid to subterfuge, in which the ultimate goal seems to be jumping the queue. It’s the Land Art, honey! Available to all, in a space of a few who not wait to them to leave all. Christo, with an emphasis on “o” because he’s Bulgarian but French by adoption and American residence, brought his art in Italy by creating floating walkways that link the mainland to Montisola and from there to the small island of San Paolo, owned by the family Beretta aka the “Lords of Weapons”. Are three kilometers yellow coated, a unique feeling that, according to the artist, would give you the idea of ​​walking on water (vaguely self-celebration saw the name of Christo…) or, at most, to slip on the back of a whale. Poetic image, true. Like yellow that turns to gold and red when the sun goes down and you should see a small color miracle. It should, in fact. Because one and half million visitors have filled the sixteen-meter width of the walkway making vague the idea of ​​change in the evening. And yet the idea remains. And here the question arises: which approach to use with this installation? Christo access to the gratuity is of prime importance at all. To him the joke has cost between ten and twelve million euro. Quiet, it was remade with the sale of projects. The community of Iseo Lake, province of Brescia just to give a rough place, has sold the heart and soul by selling the bottles of water for two euro each. It can be. A beautiful business in essence. But here we want to talk about feelings, those tested once put his foot (strictly naked!) on the first section of the trail. And, indeed, it was worth it: there is a kind of sacredness in the fruition of this work. Must live it all: touch the wet edges, lie rocked by the water roll, hear the footsteps, slow heart beats and watch the mountain that is born in the water and disappears in the sky. How many of the “undershirters” above did it? Among crying children and devoured sandwiches, was an act of mass consumed by the alleged awareness. A work of art or an attraction amusement park, the choice is yours. The most likely hypothesis is that there can be no merger between the two hypotheses. Here arises the eternal enigma about the real utility of art for mankind. Why to approach it without filters allows us to create a very personal point of view but, at the same time, does not give interpretations sending us meet the concerns. Christo’s installation zero exclusivity and become pop by definition eschewing any kind of snobbery. The intent is laudable, as well as desirable. But the risk of attracting a festive Circus Barnum is almost a certainty. Difficult to take a position on it. This kind of art is for everyone but it is not necessarily for everyone. It is not a matter of cultural superiority, but rather, the claim curiosity. To approach Floating Piers with a bit of awareness, and thus of respect, would have render futile all talks about its usefulness.